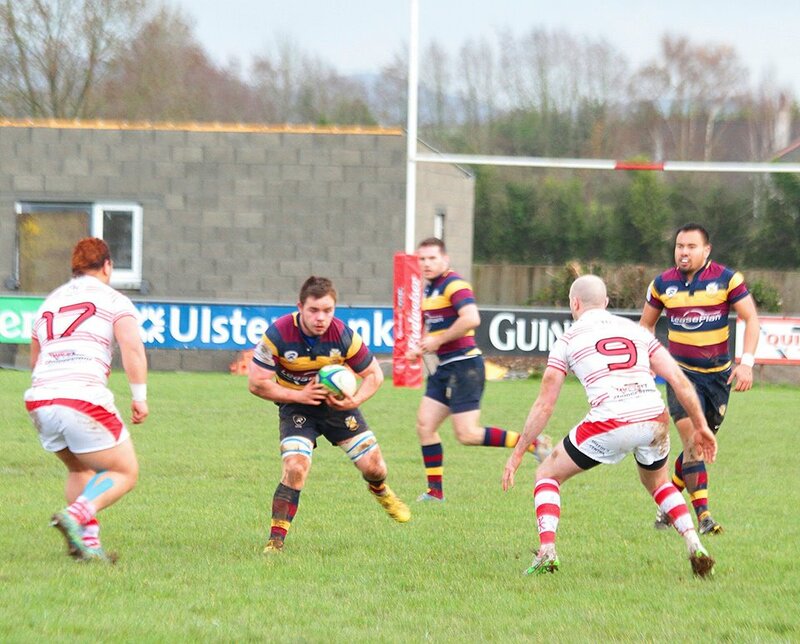 Skerries travelled to Nenagh off the back of a good win against Thomond. The two-week break allowed for all the injured players to return. The travelling faithful were looking for a back to back win for the first time this season. Young Cormac Marrey was a change in the front row, while Paul Devitt started in place of Derek Keane on the wing. The weather leaving Skerries was wet and windy and the forecast for the day was not much better. The pitch was heavy under foot and very wet in places, although the wind had dropped significantly. Skerries elected to play into the slight breeze and were on the back foot from the off after the initial kick off went short. Nenagh pushed the ball into the Skerries 22 and from the resulting maul, powered their way over the Skerries line, Kolio Hifo scored the try and Jack Molamphy , converted making it 7-0. Skerries tried to get a foot hold in the Nenagh half but on a number of occasions, kicks were left short and handling error let Skerries down. Nenagh put a number of phases together and were rewarded with a second try by Slattery which was also converted by Molamphy to leave the score 14 – 0 in favour of Nenagh. Ten mins from half time, Skerries were awarded a penalty which was duly kicked by replacement Paul O’Loghlen, who was on for James Favia. That left the score 14 – 3 at half time. Skerries needed to reply swiftly into the second half and were duly rewarded with some great play firstly by the forwards and then some great passing among the back. Paul O’Loghlen made a wide pass to Kevin McGrath in space and the rest is history. Kevin ran 40 meters to touch down leaving Nenagh players in his wake. Paul landed the conversion to leave the score 14-10 in favour of Nenagh, Game on. Ross McAuley had received a bang on the head and was duly replace by Evan Sherlock. After numerous plays, Skerries found themselves under pressure and missed tackles allowed Nenagh back into the game. Nenagh scored their 3rd try after good work from their pack. Try was scored Molamphy and converted to leave the score 21 – 10. Five minutes later, Skerries rearguard was again breach and Nenagh scored the 4th try to earn the bonus point, leaving the score 28-10. A number of replacements by Skerries saw Tom O’Hare go off injured and Ross Halligan take over in the back row, Conor Roynane take over from Neil Foster and James Faiva as a temporary replacement for Ross Dempsey. Skerries tried to run the ball wide but were hindered by a resolute defence. Nenagh made a break up the left wing and their scrum half nipped up the blind side and passed to their winger to score another try for Nenagh. The conversion was missed and left the score 33 – 10. Nenagh continued to pound away at the Skerries line and again were rewarded with a try in the corner scored by Walsh. Again the conversion was missed. This last score got Skerries moving with their best football of the match. Skerries pack drove at the Nenagh line and were rewarded with an excellent second try by Kev McGrath. He did not have to run as long as his first one but his skill was rewarded by playing heads up rugby. Paul O’Loghlen quickly slotted the conversion to leave the score 38 -17. Quick restart and Skerries responded again with some good play among backs and forwards. Eoghan Carron spotted a gap off a ruck and stretched out to the line. Paul O’Loghlen slotted the conversion to leave a more respectable score line of 38-24 to Nenagh. Skerries go into back to back meetings with Malone with the home fixture first on Saturday 5th of December.These two matches are going to be critical for our season and a big crowd is needed in Skerries this week to cheer on the team. Skerries team 1 to 20….Cormac Marrey, Chris Tonge, Neil Foster, Joe Glennon, AJ Sherlock, Thomas O’Hare, Dean Harford, Ross McAuley(capt), Eoghan Carron, James Favia, Paul Devitt, Ross Dempsey, Kevin McGrath, Eddie O’Mahony, Maurice McAuley, Conor Roynane, Ross Halligan, Paul O’Loghlen, Kieran Leonard, Evan Sherlock.